Send your affectionate wish through this gift of Romantic Gift Combo for Special One and surprise the people you love the most. 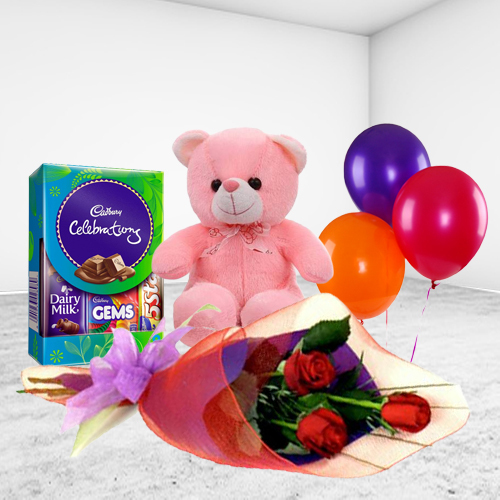 Make the season merry with these unforgettable Gifts featuring 3 Red Roses Bouquet, 3 Balloons with 6" Cute Teddy and Cadbury Celebration Mini. Flowers Delivery Amritsar, Send sweets Adilabad, Wedding Cake Gurgaon, Diwali Mithai Shimla, Send Flowers and Gifts to Panaji, Online Shop Pondichery, Flower to Kota, New Year Flowers Mathura , Fresh Fruits Pimpri, Send Gift Manipal, Dry Fruits to Sangli, Birthday Delivery Ankleshwar, Sending to Thirualla, Flower shop Delhi, Kottayam Online Cake Delivery.